I haven't been home for the last three weekends and I'll be traveling the next two as well, b ut I'm not complaining. It's been good to get out of Los Angeles and break my routine. But traveling means eating out and even if the food is great, I miss home-cooking. When I got home I wanted to make a meal but I needed to cook something that didn't take too much effort. A rotisserie chicken definitely fit the bill. With only a couple of minutes of prep, I could walk away and let the chicken cook itself. The skin seals in the meat's delicious juices while it crisps on the outside. You get the best of both worlds: moist and crisp. Whenever I've seen rotisserie masters like Thomas Odermatt of RoliRoti, they always put potatoes and onions in the drip pan at the bottom of the rotisserie. The vegetables soak up the drippings and fry crisp-on-the-outside from the indirect heat. I correctly assumed that a lot of other vegetables could be added to the drip pan and gain a flavor advantage. And there's a two-fer here: save the bones and make stock, then chop up the left over roasted vegetables or sauté new ones, and make a chicken-vegetable soup. Top with homemade croutons and you have a second easy-to-make home cooked meal. Rub olive oil on the trussed chicken, season with rosemary leaves, sea salt, and black pepper. Put onto the rotisserie spit being careful to tighten the wing nuts so the chicken doesn’t slip during cooking. If a rotisserie isn’t available, roasting the chicken in a 350 degree oven and turning every 30 minutes will have a similar result. In either case, put the vegetables into a roasting pan, toss with olive oil and season with sea salt and pepper. If using an oven, put the chicken on a roasting rack over the pan. If using a rotisserie, position the chicken on the spit so its juices will drip onto the vegetables. Every 30 minutes, toss the vegetables for uniform cooking. Cook for 2 hours or until the legs move easily, remove, lay a piece of aluminum foil over the chicken to let it rest 5 minutes. Put the vegetables on a plate and either lay the whole chicken on top or, what I prefer for ease-of-serving, cut apart the chicken and slice the breast pieces. Last week I was in London and Paris, writing an article for Peter Greenberg's travel site. In Paris my friend Randa was my guide, taking me to her favorite markets and shops. 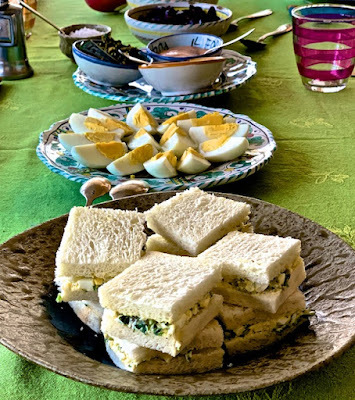 My trip was a whirlwind of activity, walking miles every day, taking photographs, eating wonderful meals, tasting chocolates, cheese, and wines, and catching up with Randa. time to sit in a cafe, enjoy a leisurely cup of coffee and while away the day talking. I knew I was going to bring back food that would memorialize the trip. Stopping in Randa's favorite cheese shop, I wanted to take arm loads of cheese, but I consoled myself with large pieces of Comté and Gruyère. From Le Bon Marché I bought two jars of Rillettes de Canard aux Olives and a large bottle of duck confit. From Goût, Thé et Chocolat near the Marché d'Aligre, a box of handmade chocolates. Back in Los Angeles, it took me 3 days to get over a debilitating case of jet lag and when I did our f riend and neighbor Norm invited me to join him at the Chef Gathering & Tasting Event. Set up in the open-air courtyard of the Bel-Air Bay Club, the gathering was a celebration of fine food and wine. 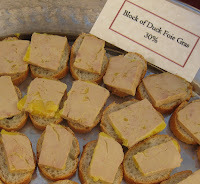 A who's-who of LA's gourmet chefs were there to taste generous offerings of foie gras from Rougié, Gourmet Imports amazing selections of cheese, smoked salmon and caviar from Universal Seafood, wines from W.J. Deutsch and Sons, Pommery champagne, and Yvan Valentin's petit fours and hand-made truffles. made by Haystack Mountain), petit fours, and handfuls of Yvan Valeni's truffles. Pinot Blanc from W.J. Deutsch and Sons, return for more samples of the foie gras and cheese, and because his good friend Pierre Sauveget (Executive Chef, Bel-Air Bay Club) had joined us, a parade of chefs stopped by to chat. Finally I was enjoying my Parisian experience, albeit only half a mile from our house.